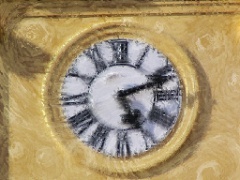 Time distortion is slowing down or speeding up our perception of time. It’s useful in lots of ways. If you’re taking a long airplane trip and you have nothing to do, you might want the trip to go by quickly. If you’re really enjoying an experience, you might like it slowed down and long-lasting. If you want to hit a baseball, having the ball moving slowly can be useful. For pain control, you can help someone perceive pain as short-lasting and comfortable periods as long-lasting. In NLP, we sometimes talk about submodalities and time distortion. Submodalities are the qualities of our thoughts; the size and color of the images in out mind’s eye, the loudness and tonality of the sounds in our mind’s ear, the timing, intensity or temperature of the sensations we experience. And we can use submodalities to affect our perception of time. How do submodalities affect perception of time? In a trance, ask your unconscious to sort out the differences between times when time seems to move quickly and time when time seems to move slowly. Ask you unconscious to make those skills available to you so you can consciously control it. Work with the scale of internal experience. It turns out that, while there is no universal way organizing submodalities to change internal experience, there are commonalities. In other words, not everybody’s emotions get more intense when the colors of their internal images get more intense, but many people’s do. The same is true with the scale of our internal images and our perception of time. For many folks, the bigger their internal images are, the slower things seem. Subjects observing differently scaled environments undergo systematic shifts in the experience of time. The experience of temporal duration is compressed relative to the clock in the same proportion as scale-model environments being observed are compressed relative to the full-sized environment. This research suggests that spatial scale may be a principal mediator in the experience of time. Translation? For most, seeing things in smaller scale makes us think time is going by faster. Bigger scale does the opposite. The same seems to be true for many when we adjust the scale of our internal imagery. It can be a quick and dirty way to do time distortion. Have you ever looked up at the night sky at the countless stars and contemplated your place in the universe? Ever notice how it changes your perception of time? That may be in part because you’re considering your scale in relation to the scale of the universe. Picturing your wee, little self in the vastness of the universe is different than thinking about that problem you had yesterday and the images you make in your imagination of the problem fill up your whole frame of reference. Wherever you are right now, close your eyes and imagine where you are. Now imagine where that is in relation to the rest of the world. Think of yourself as a tiny part of a very large world. Take a moment and check in with your perception of time. What do you notice? Now, zoom in. Make you and your immediate surrounding (and I mean the surroundings within a few feet of you) fill all of your imagination. Change the scale. Imagine that, although everything keeps its current size in relation to you, it’s all growing larger. You’re twelve feet tall and the things around you are bigger! How about 40 feet tall? Take a moment and check in with your perception of time. What do you notice? Now, keeping the environment that same size, in your imagination, shrink yourself down. For me, the chair next to me is 20 feet tall but I’m tiny. Notice if changing your scale relative to your environment changes your perception of time. I’m interested to hear about your experience with this! Leave a comment below.